It’s easy to stress over decorations when planning a party. I sometimes let my mind get carried away and convince myself that EVERYTHING needs to be decorated when in reality, my favorite parties are simple, low stress events. 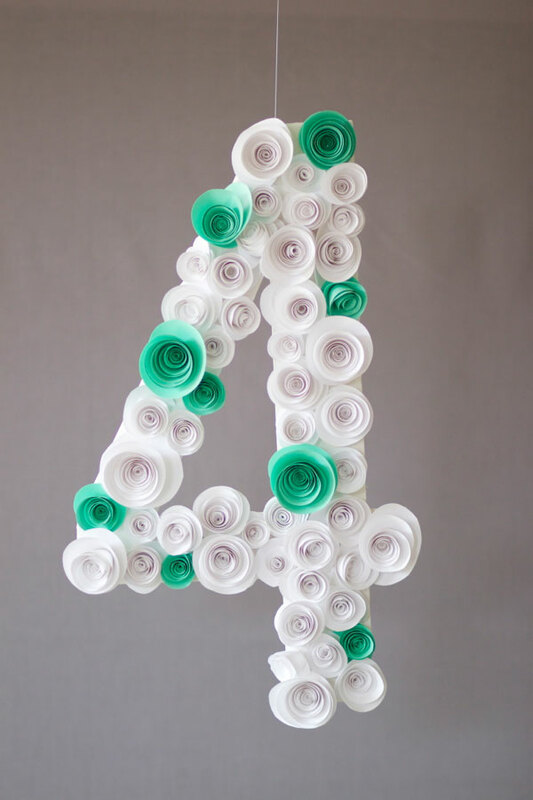 This foam board number cut out that has been covered with spiral paper flowers will give your space a nice festive feel and won’t cause any undue stress when it’s time to decorate. 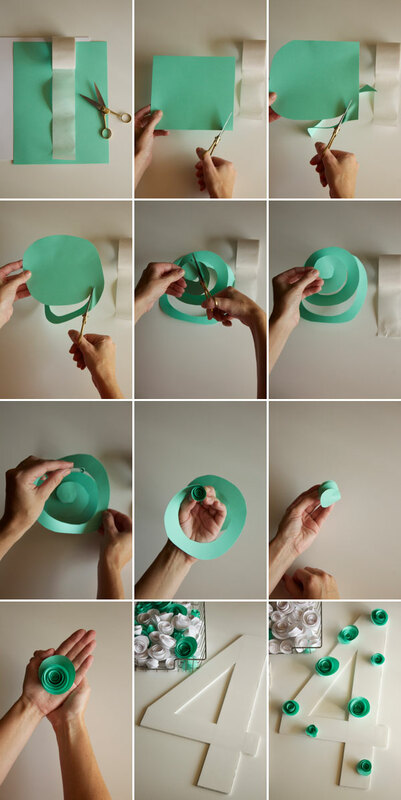 Step 1: Cut your cardstock into a square. Step 2: Round off the corners of the square. Step 3: Begin cutting the cardstock into a spiral, working your way to the center. Step 4: Leave the center circle about the size of a quarter. Step 5: Add a couple of Glue Dots to the center circle. Step 6: Begin rolling the end tail of the spiral. Step 7: Hold the paper tightly as you roll so as to not unravel the flower you’re creating. Step 8: When the spiral has been completely rolled to center circle, simply press the the flower spiral and the circle center together. The glue dots will keep the flower from unraveling. Step 9: Cut out a number or letter from foam core board. Step 10: Attach the flowers to the board using glue dots. I love this! So simple yet chic! Oooooh, I love this idea! And the color palette you chose is just lovely. those are the dang near cutest paper rosettes ever. i LOVE this tutorial danyelle! i hear ya, i just had my kid’s 1st birthday party and it was idea overload… i ended up keeping it pretty cute and simple and it was much more relaxing for me and our guests! 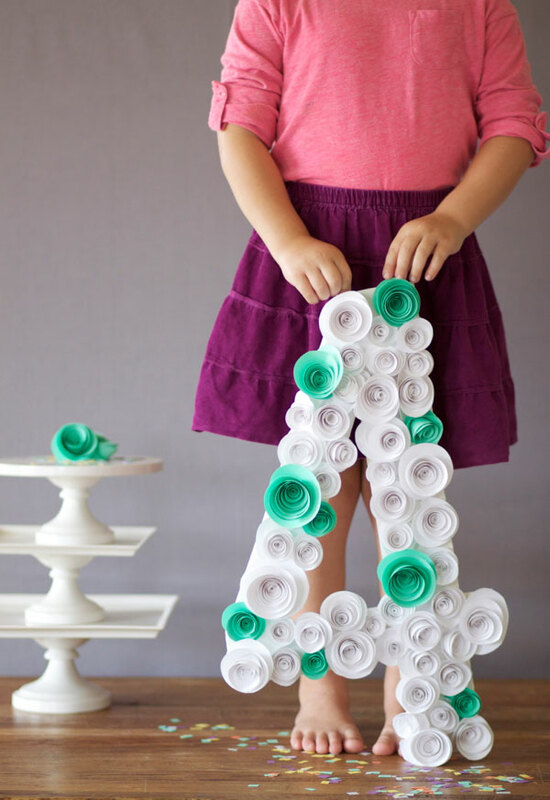 cannot wait to try this rosy cute idea for something! thanks for posting! What a cute decoration for a kid’s birthday party. It would also make a great photo op prop! So adorable!! SUCH a good idea! I can’t wait to try this out!! Amazing! And lots of work to to go through all of the flowers. Can’t wait to see the rest of the decor! WOW! My little brother turned 4 few days ago and I’m sorry I didn’t find this DIY idea before.. I think more instruction may be necessary here. Wow! Love this idea – and it looks so simple to do, too (though, don’t all DIY projects seem to start out that way?!). And I totally agree on how easy it is to go overboard with decor and planning for parties – we’re a little over a week away from my kiddo’s first birthday, and I’ve pretty much made this into my own mini- wedding. You’d think I’d have some perspective considering she’s not even going to remember this, but sadly, I don’t. Even still, I’ll be adding this idea to next year’s decor list . . .
How do you get them to look like anything other than rolled up tubes of paper? That’s what I keep ending up with. I love the simplicity of the large numbers. Big impact and clean lines. So pretty! Your work is so lovely! Happy weekend! Can you tell me where you found the mint paper ? Thanks ! I’m afraid to ask, but how long did it take to decorate that 4? It’s so beautiful, but yikes, that looks like an entire day’s work for someone like me! i’m speechless..this is so adorable!